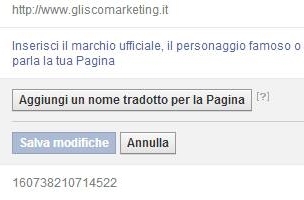 Facebook Asking Page Admins To Add Translated Names Of Their Pages? In January, Facebook began rolling out language-specific names for users, allowing their names to be displayed in the native languages of a select few countries. Now it appears that the social network is testing a similar feature for pages. Reader Veronica Gentili shared the screenshot above, in which she was prompted to add the translated name of her page in other languages. Page administrators: Have you seen anything similar?